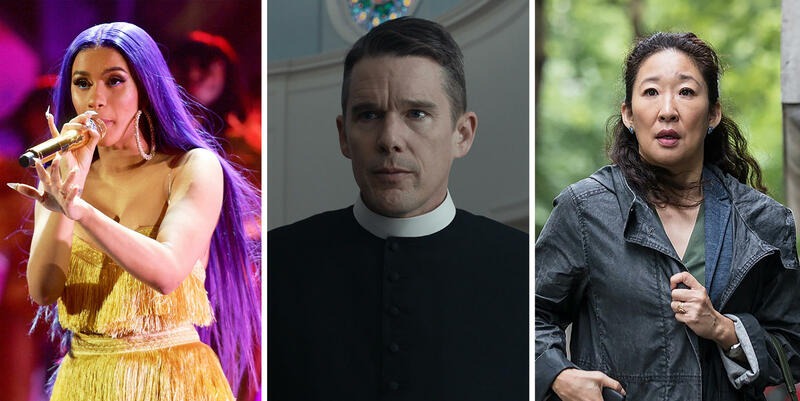 Cardi B; Ethan Hawke in First Reformed; Sandra Oh in Killing Eve. Every December, our critics look back on the books, movies, music and TV they loved — and this year, we've gathered all of those Fresh Air recommendations for you in one place. Below you can find Maureen Corrigan's book list, Justin Chang's movie list, David Bianculli's TV list and Ken Tucker's music list. You can also explore John Powers' annual "ghost list" the things he didn't get the chance to talk about on air — and find out what Geoff Nunberg chose as the "word of the year." My pick for novel of the year, Makkai fills this sweeping story about the AIDS epidemic of the 1980s and its long, numb aftermath with vivid characters; absorbing questions about art, belief and transcendence; and most improbably, lots of wit. Shteyngart dusts off our most hallowed literary trope — the on-the-road novel — and takes it for a satirical spin through an America on the verge of a Trump presidency. Orange's inspired debut novel is set in Oakland, Calif., and delves into the lives of urban Native Americans. The 10-page prologue — which riffs on some 500 years of Native People's history — is alone worth the price of this book. This novel is a mysterious tale about two children abandoned to the care of a stranger in the postwar London of 1945. At this point in Ondaatje's celebrated career, it's almost unnecessary for me to say that his writing is gorgeous; his story haunting. Opening on a sugar plantation in Barbados in 1830, this novel is narrated by an enslaved 11-year-old boy known as "Wash." Wash escapes from that plantation — via hot air balloon, no less! — and Edugyan breaks away from the conventional, transporting readers into the giddy realms of Romantic travelogue and scientific exploration. When Johnson wrote at reckless full force, as he does in many of the stories in this posthumously published short-story collection, his words blasted barriers, discovering those odd places where, as one of his narrators here says, "the Mystery winks at you." This lost treasure of a book was crafted out of interviews Hurston did in Alabama in 1927 with 86-year-old Cudjo Lewis, the last known living person who could recount firsthand the experience of being captured in Africa and transported on a slave ship to the United States. Barracoon dramatizes two extraordinary voices in conversation. Sharp is an entertaining and erudite cultural history of 10 women who became critics and public intellectuals even though, as Dean says, "they came up in a world that was not eager to hear women's opinions about anything." Dean's subjects include Zora Neale Hurston, Mary McCarthy, Pauline Kael and the immortal Dorothy Parker. This debut memoir is one of the smartest books about class in America that I've read. Smarsh hails from the white rural working class and she writes about politics, race, cooking with Crisco and class contempt with a lyrical boldness. The best new movie I saw this year might also be the hardest to pin down: A piercingly sad romantic triangle, a dark comedy of class rage and a slow-simmering thriller, Burning affirms the South Korean writer-director Lee Chang-dong as a master of psychological tension and one of our finest living filmmakers. His tale of a young man on a lonely quest for meaning found a gripping echo in First Reformed, Paul Schrader's politically charged, aesthetically rigorous and spiritually profound drama about a Protestant minister (a career-best Ethan Hawke) undergoing an insoluble crisis of faith. The Argentinean director Lucrecia Martel (The Holy Girl, The Headless Woman) returned from a long absence with Zama, her feverishly brilliant portrait of an 18th-century Spanish magistrate wasting away in a remote South American outpost. In dramatic, formal and commercial terms, it couldn't be more different from Black Panther, Ryan Coogler's thrilling and magisterial superhero epic about an unspoiled African utopia, and yet both pictures somehow arrived at the same damning vision of colonialism and its discontents. Two of the year's best ensemble movies reveal how a family comes together to help a marriage endure. Tamara Jenkins gave us Private Life, her note-perfect dramedy about a couple (the beautifully matched Paul Giamatti and Kathryn Hahn) undergoing round after round of fertility treatments. Barry Jenkins (no relation) followed up his Oscar-winning Moonlight with the James Baldwin adaptation If Beale Street Could Talk, a drama of black resilience so swooningly gorgeous it seems to have invented a new cinematic love language. These films offer two sublime contemporary riffs on the Western genre, superbly acted by nonprofessional actors and directed with exquisite sensitivity to character, landscape and cultural nuance. Chloé Zhao's The Rider follows the story of a Lakota cowboy struggling to quite literally get back on his horse; Valeska Grisebach's Western observes the uneasy dynamics between a Bulgarian village and the German laborers in their midst. Two prize-winning standouts from this year's Cannes Film Festival offered beautifully compassionate yet bracingly tough-minded visions of communal life. Shoplifters, a career milestone for the Japanese master Hirokazu Kore-eda, unravels the mystery of a makeshift family that steals to survive. Happy as Lazzaro, a career breakthrough for the Italian director Alice Rohrwacher, begins as a realist portrait of exploited sharecroppers and ends as a magically time-bending humanist fable. Three women perform an intricate psychological dance, with two locked in a vicious tug-of-war for a third's affections. It's a description that suits The Favourite, Yorgos Lanthimos' acid-drenched tragicomedy set in the court of Queen Anne (the magnificent Olivia Colman), but also Madeline's Madeline, Josephine Decker's exhilarating cine-whatsit about a teenage actress (the startling Helena Howard) navigating the perilously thin boundaries between art and life. This spinoff of Breaking Bad continues to be a worthy successor of its parent program. This year, Bob Odenkirk's Jimmy began the season by eliminating one of its central characters and ended it by coming close to officially introducing the title character. "S'all good, man!" Two seasons in, and I'm still not sure what series creator Noah Hawley is doing here — but I'm loving it. It's a superhero show where the central character doesn't yet understand his own superpowers, and might not even be a hero. But the visuals are the best on TV, and the imaginative approach to storytelling is just as challenging and inventive. This period spy series became more and more relevant every season, and wrapped up just as Russia and spies were back in our daily headlines. It ended with a finale that was just about perfect, with an impeccably chosen piece of music, U2's "With or Without You," punctuating the surprises and the overall message. Sandra Oh and Jodie Comer starred as a pair of dizzyingly different spy-story adversaries. Comer was Villanelle, the international assassin for hire who seemed to relish her work, and Oh played the government researcher hot on her trail. And "hot" had more than one meaning, because the two women were mutually attracted to each other. Killing Eve served up shocking surprises all season, and two deliciously captivating lead performances. Philosophically speaking, this is the best and funniest sitcom in TV history — at least literally, in a philosophical sense, because it's all about philosophy. The Good Place manages to ask the biggest of questions while drawing big laughs and pulling off sneaky, stunning shocks that any magician would envy. Oh, and Ted Danson is enjoying, and making the most of, the role of his career — again. This comedy series dropped Season 2 just in time to make this Best of 2018 list. It's even better than the first season, which was good enough to win the Outstanding Comedy Series Emmy for Amazon. Amy Sherman-Palladino and Daniel Palladino have crafted an even better set of stories out of the title character's rise to standup-comedy success — and Rachel Brosnahan makes her character totally believable as both a comedienne and a woman fighting for her identity in the Mad Men era. Tony Shalhoub, as her father, makes me laugh every time he's on screen. Season 2 of Hulu's dystopian drama ended on a slightly less dour note than it began — but it almost had to. And Elisabeth Moss, as the once and still Offred, makes you feel every loss and indignity as though it were your own. A passionate performance that, once seen, cannot be shaken, or forgotten. Both of these miniseries were outstanding not only because of their significantly damaged lead characters, but also because of the painterly way they were photographed and edited. These series had to be watched very closely, up to the very end of the last episode's final credits, and rewarded such close scrutiny. Amy Adams (Sharp Objects) and Benedict Cumberbatch (Patrick Melrose) are both remarkable in their central roles. This HBO dark comedy was a total, and gleeful, surprise. Bill Hader plays an assassin for hire, but, unlike Villanelle on Killing Eve, one suffering from a sort of midlife crisis, and professional ennui — until he ends up enrolled in acting class, with Henry Winkler making the most of a late-career role as the acting instructor. This is a gorgeous collection of songs that Thorn has aptly called "nine feminist bangers" about sisterhood, motherhood and taking control of your life. The year's best country album is also one of the year's best pop albums: Ballads, honky-tonk and psychedelia, all filtered through Musgraves' witty songwriting and singing. Turning a superhero soundtrack album into its own kind of art form, Lamar curated and participated in a superb anthology of current hip-hop and pop styles. Rigby summed up her career thus far, even as she debuted her toughest, most resilient music to date. A shrewd humorist, Cardi proves on her debut album that she's also a tough realist. The trio of Miranda Lambert, Angaleena Presley and Ashley Monroe stampeded over the bones of bad relationships and idiot men with raucous harmonies and tightly fashioned lyrics. This was Monáe's audacious move into pure pop and it's written with artful cleverness, sung with a sharp tongue. His first album in 13 years finds the 72-year-old cancer survivor knocking on heaven's door with some funny, salty, wise songs. Barnett's songs here are like inner monologues shaped and sharpened for public consumption. Robert Christgau, Is It Still Good to Ya? Not a piece of music but a book: the best of 50 years of work by the self-proclaimed "Dean of Rock Criticism." It's a treasure trove of the most incisive, witty pop music reviews and commentary ever committed to print.